Sprong's 2 goal Game 1 gives him league lead with 5. Hershey - Hershey made a ton of switches to their forward lines looking to provide a spark to the offense. Dustin Gazley replaced the suspended Liam O'Brien in the Bears lineup. The Bears also juggled their D-Pairs while playing the same 6 skaters. Wilkes-Barre - Sahir Gill was back in the Penguins lineup for the first time since undergoing groin surgery in early February, and played with Teddy Blueger and Josh Archibald on the 4th line. Adam Krause jumped up to the 3rd line. Steve Oleksy returned from Pittsburgh and was paired with Will O'Neill against the team he captained last season. Rock solid D-Man Niclas Andersen became a new father on Thursday evening and did not dress. Donatelli started his most productive line of the playoffs going with the Rowney line. The Bears came out and controlled the puck for the first shift or two and were already off to a much better start than Game 1. Sahir Gill and the WBS 4th line had a great first shift, and may have been the best line for the Pens in the 1st. Steve Oleksy flipped a puck to the net about 3:30 in and TK nearly tucked it behind Peters who stayed down on it and covered it up. WBS nearly scored on their first of two PP's in the period. Daniel Sprong brought two Bear killers to him, and slipped a puck to Mouillierat in the slot who shot it just wide of an open net. On their 2nd PP, Daniel Sprong turned a puck over to Gazley who made a perfect dish to Sean Collins who beat DeSmith on his backside. The Bears took the momentum from the SH goal and were looking for more, and they got it in the form of a great pass from Vrana to Camper who beat DeSmith from a really bad angle. Casey wants that one back I am sure. WBS did get a huge PK at the end of the period to make it a perfect 6/6 in the series. The shots were in favor of Hershey 10-5 despite the Penguins have two PP's. The Bears certainly showed how quickly they can strike, they weren't the 3rd best offense in the league for nothing. The bad blood reared it's ugly head early and often in the 2nd frame. The teams skated 4x4 after matching roughing minors, and Casey DeSmith made a huge save on Walker to keep his team in it. Dustin Jeffrey took an errant Chris Bourque pass and skated in on Peters all alone but his forehand-backhand move was denied as Peters kept his pads down tight on the ice as Jeffrey tried to slide it through. The teams would trade chances back and forth and both Goalies were up for the challenge making multiple good saves. Hershey would get a 5x3 for 1:55 and it looked like they were poised to ice this one away but the Pens PK went to 8/8 in the series after shutting it down rather easily. 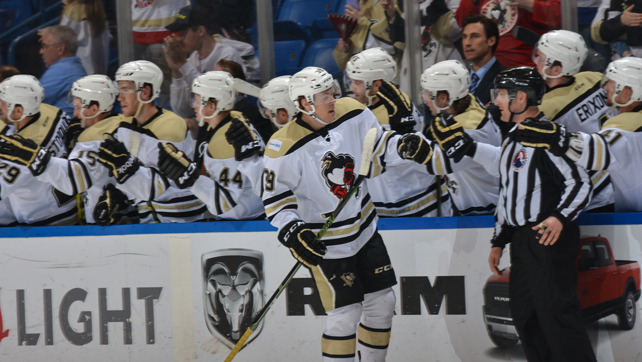 Following the kill the Pens got good looks from Sprong and Krause but were unable to find twine. Former Penguin fan favorite Zach Sill took a minor for a hard crosscheck to the back of Sahir Gill in the final minute. WBS failed to score, and the PP would carry over to the 3rd. Shots were 19-13 in favor of the home team through 40 minutes. The Penguins had about a minute and a half of PP time to work with on fresh ice, with a chance to make this anyone's game. They did not generate anything out of it, and it would turn out to be costly. Hershey clogged up the shooting lanes and wouldn't allow anything from the outside to get anywhere near Peters. The rough stuff calmed down for the most part, and it was a pretty choppy 3rd period. The bears were willing to take icings all period long, and they were strong inside their own zone. The Penguins provided some pressure late with the extra attacker but could not figure Peters out. The best chance for either team came on a Tyler Lewington blast off of the post about Midway through the period. Credit Hershey for making the necessary adjustments and taking advantage of Simon's absence. - The WBS forecheck had been the key to their postseason success up until tonight, Hershey exited their own zone effortlessly all night long. When you allow them to do that they are awfully dangerous off of the rush and will eventually make the Pens pay for it. - The Pens' offensive depth took a huge hit with the absence of Dominik Simon. With him on the 3rd line there is a true sniper on each of the top 3 lines, without him it was clear that Hershey was able to match up much better with WBS. - For the 3rd time this postseason WBS allowed a SH Goal. That is very disturbing and the fact that a SH Goal gives your opponent so much momentum, it could eventually be the death of this group. - It will be very important to see how this team responds to their first playoff loss. I expect them to be fine due to the vast amounts of veteran leadership in that room. That said, if Hershey wins Game 3 in WBS tomorrow night, The Bears will be in the driver's seat for sure. - Maybe the biggest moment came early in the 2nd period when Justin Peters out-waited Dustin Jeffrey who was all alone on a breakaway. Peters picks up his 2nd shutout of the post-season and has absolutely eye-popping numbers thus far. Hershey may not have made it out of round 1 if not for the goalie. - Casey DeSmith played well in net again, although I'm sure he would like that 2nd goal back. At the end of the night he did his job without question. Will Donatelli play him tomorrow in the 2nd of a back-to-back, or will Tristan Jarry finally get his shot to prove his playoff worth? - Game 3 is tomorrow night at 7:05 pm, we will have a late night recap much like this one. Thanks so much for reading, hit me up on twitter @jfoo1654 with your input!